I love music, always have. I'm not emotional but good music can get me crying all the time. I don't appreciate visual arts as much as some (weird that I'm into quilting, isn't it?) but darn if I can't gush over a musician's instrumental tone and genious (voice or actual instrument). I love singing and pretend I'm Broadway quality by belting it out in the car (without anyone else in it, of course.) I thoroughly enjoy picking out and singing the harmonies instead of the melody, too. 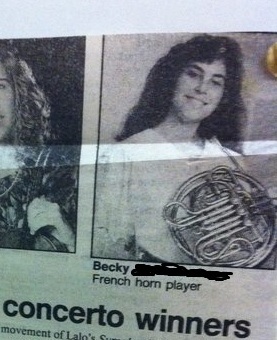 I used to play french horn (mellophone in the marching band), trumpet in the jazz band and occasionally flute. I enjoyed violin when I first started playing music but moved to brass and never took it up again. My sons play clarinet and viola and I'm thrilled they choose to. I won a solo position with the Binghamton Youth Symphony when I was in highschool. I was able to enjoy being a back up musician to Eric Ruske (french horn) and be able to take a master class with him. Eric was then a part of the Empire Brass Quintet. (He's not listed on the Scranton music website, though, as a past performer, but I promise I did not make it up.) There were other members of the quintet I also played back up to (as part of the symphonic band) but I just want to highlight my top 3 musical experiences overall. I was also able to play jazz with Wynton Marsalis. Yes, you read that right... Wynton, people! All I can say is it's awesome to be near gifted musicians. It just rubs off on you, you're jazzed (forgive the pun) to play better. 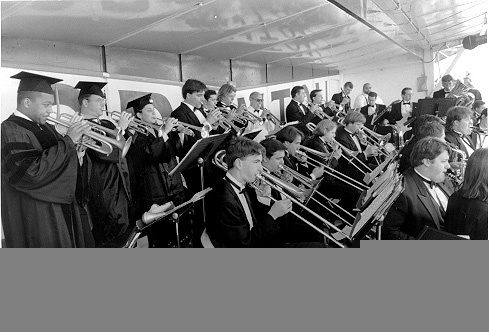 Check it out, Wynton is on the left, my ex-husband next to him and then there's me! So there you have it people, I love music. Singing, playing and listening. Maybe one day I'll play often enough to be able to join a community orchestra but for now, I'll just reminesce. Check out other Favorite Things by linking over to Quilting in My Pyjamas today. How wonderful to be able to do all those things and what a great favorite! I love the pictures (especially the big hair) and that you shared such a special time with us. Me, too! (thus the 2 degrees in music), but I was more of a choir & musical kind of gal. Love it, love it! Thanks for the post! I loved reading your post and finding this out about you. How awesome!! How long have I known you ? And I had no idea you had this hidden talent! I can tell from your post that you're still passionate about music and that those memories of accompanying gifted musicians are among your most favourite. I am not musically inclined and cant play any instrument at all! I had perms to get the big hair, so I was paying a lot for it. I played the recorder in junior school but that was it. No talent at all, but its lovely that you have such wonderful memories. My dad was an accomplished musician. Alas, I did not inherit the genes, although he tried his darnedest to teach me. That said, I have a great love for music. It was always a mainstay in our house and continues to be an important part of mine. Wonderful post....I loved reading all about your musical prowess and loved that you got to play with some of your idols. Great photos. I am musically inept, other than listening - but I do admire people who have a tallent and joy for it. Great FTF! Weigh-In Wednesday is back. Join me?